Conductors are those substance through which electric charge easily. Insulators: Insulators (also called dielectrics) are those substances through which electric charge cannot pass easily. The potential V of a conductor depends upon the charge Q given to it. It has been observed that the potential of a conductor is proportional to the charge on it. The capacity of a conductor is defined as the ratio between the charge of the conductor to its potential. The capacity of a conductor is also defined as the charge required to raise it through a unit potential. The capacity of a conductor is said to be 1 farad if a charge of 1 coulomb is required, to raise its potential through 1 volt. The capacity of a conductor is said to be 1 stat farad is a charge of 1 stat coulomb is required, to raise its potential through 1 stat volt. Here, ‘C’ is in farad and ‘r’ is taken in meter. A capacitor or a condenser is an arrangement which provides a larger capacity in a smaller space. It is based on the principle that when, an earthed conductor is placed in the neighborhood of a charged conductor, the capacity of the system increases considerably. 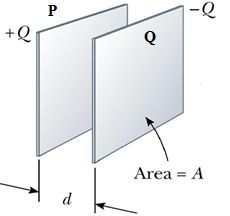 It consists of two plates P and Q of a conducting material held parallel to each other, separated by a certain distance as shown in the figure. The space between the two plates contains some insulating material (may be air). 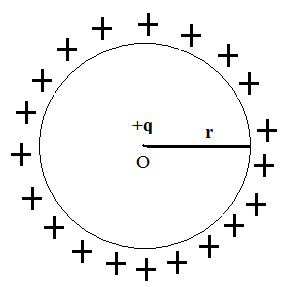 The plate P is charged while the plate Q is connected to the earth. As the unit positive charge on the point of a observation A moves away from Q,  and  are directed away from each other. Where ‘A’ is the common area of two plates. This the formula for a capacity of a parallel plate condenser. Consider a parallel plate condenser having a separation ‘d’ between its plates and with dielectric slab of the thickness ‘t’ in between them. Let K be the dielectric constant of the material of the slab. Let the plate P be charged with a charge ‘+q’. 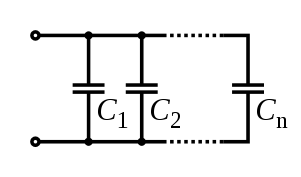 σ = q/A, where A is its area. Let the electric field in the free space between the plate be E and that inside the dielectric slab be E'. 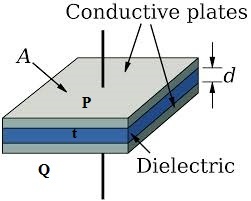 The potential difference V between the two poles P and Q of the capacitor is the work done in taking a unit positive charge from Q to P which is equivalent to the work done in taking a unit positive charge through a distance (d-t) in free space plus the work done in taking a unit positive charge through a dielectric of thickness ‘t’. In case, the space between P and Q is completely filled with the dielectric medium, then t = d.
Comparing equations (1) and (2), one concludes that dielectric thickness ‘d’ is equivalent to a free space of thickness d/K; where K is the dielectric constant. Thus, the reciprocal of the resultant capacity of a number of capacitors, connected in series, is equal to the sum of the reciprocals of their individual capacities. The potential difference (V) across each of them is same. Thus, the resultant capacity of a number of capacitors, connected in parallel, is equal to the sum of their individual capacitors. Capacitance is the ratio of charge to potential difference. Charge resides on the surface of a conductor. Condensers are said to be in parallel if each of them has same potential difference across its coatings. Condensers are said to be in series if each of them has same charge on its coatings. Capacitance always decreases when you move the plate apart. Capacitance always increases when you put a dielectric (instead of air) between the plates. The dielectric constant is the property of the dielectric material and varies from one material to another increasing the capacitance by a factor of k.
The dielectric provides mechanical support between the two plates allowing the plates to be closer together without touching. Permittivity of the dielectric increases the capacitance. The dielectric increases the maximum operating voltage compared to air. After charging q will become constant. From the above observation we conclude that, option (d) is correct. A capacitor is connected to supply with switch and the switch is connected between capacitor and supply. Initially switch is open at time zero, and then switch is closed. Then how capacitor behaves at time t = 0+ ? (a) short circuit. (b) open circuit. (c) dielectric losses decreases. (d) dielectric losses decreases. A p.d. of 300 V is applied across series combination of 3 μF and 9 μF capacitors. 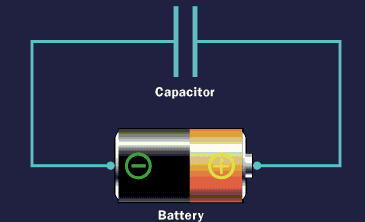 The charge on each capacitor is ___________________ μC. You might like to refer Energy Stored in a Capacitor. To get answer to any question related to Capacitor click here. To read more, Buy study material of Electrostatics comprising study notes, revision notes, video lectures, previous year solved questions etc. Also browse for more study materials on Physics here.